People have been mining clay and firing it into tiles to roof their houses for centuries. In fact, there is evidence of clay being used for construction as far back as 13,000 B.C. The clay used in Braas Monier’s tiles is usually sourced from the local region. Our traditional-looking clay tiles have beautiful natural textures, and add a touch of warmth and handcrafted appeal to any roof. Available in an extremely wide variety of shapes, surfaces and colours, our clay tiles also serve a decorative purpose. Braas Monier is proud to offer tiles to suit different requirements and various personal tastes. Plate de Pays, another outstanding tile from Braas Monier, is a testament to the aesthetic quality of roof tiles that go beyond protection from the elements. These French tiles give a delightful natural look that blends harmoniously with the surroundings. Their warm and earthy colours look similar to the natural patina that builds up over the years, and make Plate de Pays tiles the ideal choice for traditional roofs and restoration projects alike. Rosemary Clay Craftsman tiles from the UK combine beautiful natural textures and warm, rustic colours. Made from the finest carefully selected clays, Craftsman tiles feature a variable hanging length, leading-edge distortion, subtle textured surfaces and rich colours. The result is a tile with a handcrafted look that accurately replicates the appeal of traditional clay tiles and combines it with up-to-date product features. Our revolutionary Rubin 13V tile combines traditional design and state-of-the-art technology. Its variable headlap makes it easy to lay, and its manganese-brown colouring runs right through the tile body. It is a highly functional yet attractive tile that has already proven itself on roofs all over the world. Available in an impressive 14 shades and with a choice of three different surfaces, the Rubin 13V received – just as our Tegalit tile – the 2010 red dot award in the category “product design”. The discreet contemporary look of the Topas tile, designed to blend into any environment, makes it an all-time favourite for high-end roofing projects in the new-build sector. The fact that it is quick and easy to lay, and that only 13 tiles are required per square metre of roof, also make it popular for roofing renovations. The Topas is produced in Germany and is also available in the UK and Russia in various colours and with different matt surfaces. De Nieuwe Hollander ("the new Dutchman”), a technically advanced tile with a premium look, is the result of Braas Monier’s many years of experience in tile manufacturing. Its width of 225 millimetres fits exactly into the 300-millimetre gauge commonly used on roofs in the Netherlands – a fact which makes it very popular there. A wide range of colours are available, from copper red to deep black, and there is a choice of several different natural or gloss surfaces, providing even more customization options. De Nieuwe Hollander is perfect for traditional-looking roofs in Holland, and is also available in other countries around the world. The Coppo Domus tile is ideal for traditional Italian-style roofing. It is available in six different colours, which can be combined to create beautiful roofs – as has been proved not just in its native Italy, but in many other countries too. This contemporary high-performance clay tile with its handcrafted look brings a touch of traditional elegance to any roof. Galleane roofing tiles from France are available in an exciting variety of colours and different nuances, which can be combined to create beautiful, Mediterranean-style roofs that are totally individual yet at the same time blend harmoniously with their surroundings. Galleane tiles have a traditional look, yet meet all the functional requirements of modern roofing. They are available in several countries and with many different profiles and surfaces. The hollow Gammel Dansk (“old Dane”) tile is an all-time classic for Danish roofs. It is comparable to the Achat tile sold in Germany. With its curved shape and natural red colour, it adds a touch of warmth and Nordic design flair to any roof, while also being sturdy enough to withstand harsh Scandinavian weather conditions. Produced according to traditional Danish methods for generations, the Gammel Dansk gets even more beautiful with age. It is sold in various countries around the world. The Vittinge tile is more popular in Sweden today than ever before. 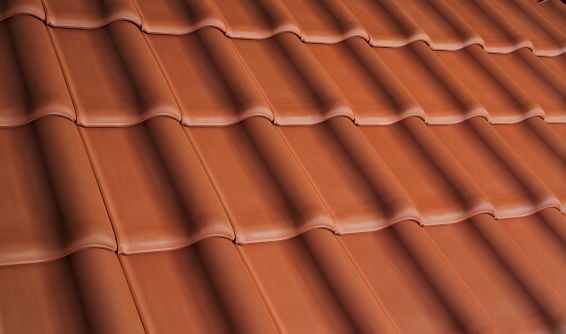 With a classic look that never goes out of fashion, it is the number one tile for roofing renovations and is used for all types of buildings, from churches to farmhouses. The model dates back to the early 1900s. It is produced at Monier’s plant in Vittinge – the only clay tile factory in the whole of Sweden. The Marseille clay tile was first produced back in 1874, when it was patented along with the first industrial clay presses. The fact that moulds and presses were sold as a package ensured all tiles were regular in size and made it the first global roofing standard. In France, the Marseille clay tile is available in three colours, adding a personal touch to any roof, while still fitting in with the surroundings. Versions of the tile are also sold by most of Monier’s business units in Europe and Asia. For homeowners who like roofs with unusual, instantly recognisable visual effects, the Granat (the German version of the Marseille tile) is the perfect choice. Its distinctive yet traditional profile makes it equally suitable for renovating roofs, restoring historical buildings and roofing stylish new-build houses. The Granat is available in six different colours and with a choice of two different surfaces.